Universal headshell for 4-pin turntable cartridges, fits the LP120-USB/ LP240-USB/ LP1240-USB/ AT-LP5 direct-drive professional turntables. 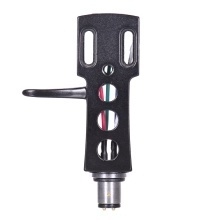 Aluminum alloy body with an integral finger lift, durable and convenient to use. Equipped with a rubber washer for a secure fit to tone arm of your record player. High-quality OFC(oxygen free copper)lead wires with gold plated terminals. Great replacement for the old headshell of your record player.